Save your Florida jokes for the end, please. As a Florida native, I&apos;ve become somewhat immune to jokes about "Florida Man" and how weird people find my state -- mainly because, yea, we produce a lot of weird news stories. On Tuesday, my hometown of Ocala, Florida, made a decision that we can now add to that list. The Ocala Star Banner reports that the Ocala City Council (which, in the interest of full disclosure, includes my uncle Jay Musleh) voted 4-0 to make sagging pants punishable by up to a $500 fine and up to six months in jail -- the maximum punishment possible for a misdemeanor. Ocala is one in a growing string of cities to ban sagging pants. In the last year, Wildwood, New Jersey, Jefferson Parish, Louisiana, and Pikeville, Tennessee also proposed similar ordinances. Where the Ocala decision differs, however, is in the punishment. Many of the other cities mentioned fine no more than $50 for repeat offenses; Ocala proposes up to $500 and jail time. That punishment will decided by the judge -- members of the council find it "very unlikely" the maximum fine will be imposed except in extreme cases. The ordinance will be enforced very similar to noise ordinances. Offenders will be asked by officers to please pull their pants up. "We are not looking to charge people," Gilligan tells the Star Banner. "If they don&apos;t comply, I think the chief will tell police officers to take your phone out and take a picture." Offenders will be asked to appear in front of a judge, who would then use said photo to determine whether the person was in violation of the ordinance. Perhaps most interesting is that the ordinance was championed by Councilwoman Mary Rich, the only woman on city council -- and also the only black person currently serving. "It&apos;s disrespectful," Rich told the Star Banner about sagging pants. "If you pull them up, you might be a better citizen because you may be able to find a job, J.O.B." Rich initially proposed the ordinance back in 2009 but could not find support, mainly over objections that the law could lead to racial profiling, with which Rich disagrees. "It doesn&apos;t matter what color they are," she told the Star Banner. "They all wear their pants down." Here&apos;s the thing: Despite what Councilwoman Rich says, it is completely naive to suggest this law won&apos;t be used to profile minorities. The South, including Florida, still has an incredibly complicated relationship with race and racial issues. In the wake of the Trayvon Martin case -- yes, another Florida story -- I find this especially troubling. Remember, George Zimmermann found Martin threatening partially because he was a young black man wearing a hoodie. "We will use a great deal of discretion when we enforce it," Ocala Police Chief Greg Graham told the Star Banner when asked if officers would use the ordinance to stop and search subjects for things like drugs. If officers make an arrest, of course, they will legally be entitled to search the person. In previous cases, these laws have been challenged by the ACLU for being unconstitutional. In 2008, Palm Beach Circuit Judge Paul Moyle ruled that a similar law in Riviera Beach, Florida, was unconstitutional after a 17-year-old spent the night in jail. When asked if the new ordinance was constitutionally vague, Gilligan responded, "I don&apos;t think it is." This is hardly a new issue either. Leading up to the election in 2008, President Obama was asked by MTV how he felt about sagging pants laws. "Here’s my attitude: I think passing a law about people wearing sagging pants is a waste of time,” he said. “Any public official who is worrying about sagging pants probably needs to spend some time focusing on real problems out there." “Having said that," he added, "brothers should pull up their pants." That last one got your attention, eh? If at first you don't succeed... A bill proposing jail time or a stiff fine for purchasing counterfeit goods originally proposed in 2011 is getting a new push by New York councilwoman Margaret Chin. 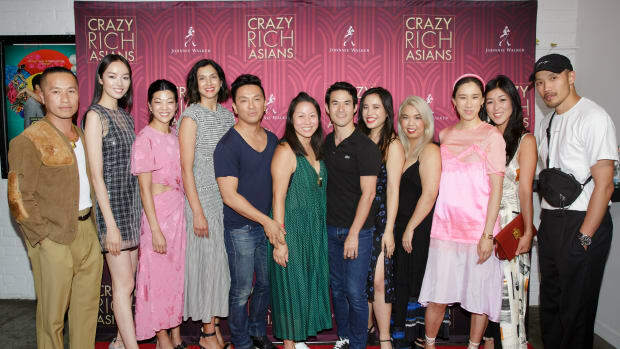 A who's who list of fashion insiders put on a special screening of "Crazy Rich Asians" to celebrate seeing diversity on-screen. Dolce & Gabbana designers Domenico Dolce and Stefano Gabbana have been found guilty of tax evasion and sentenced to prison.